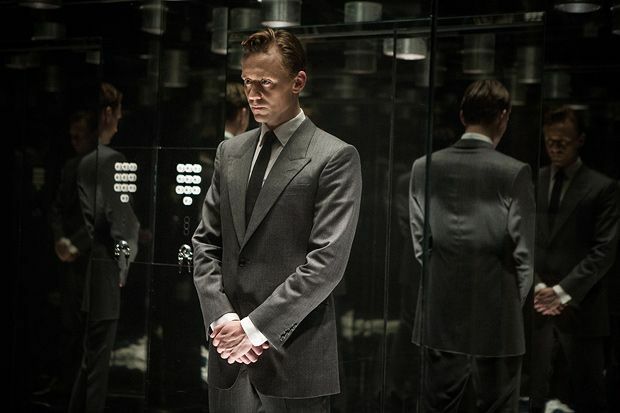 If there's a scene that sums up the spirit of High-Rise, Ben Wheatley's bravura take on JG Ballard's 1975 novel, it's early on when Tom Hiddleston's unflappable Dr Robert Laing slips the face off a dismembered head, in the manner of rolling down a stocking, as a group of startled medical students look on. Spectacularly disgusting it may be, but this is one of many moments of transgressive mischief in a film that's fittingly concerned with the throwing out of rules and the peeling back of facades, and that finds grotesques in every stratum of society. As we enter the self-contained 70s tower block – a jagged, hive-like structure, isolated on the edge of town – things have already descended into an every-man-for-himself situation. The recently bereaved, clinically detached Laing seems to have taken the turn of events very well as he hunts down a dog and roasts its leg on a homemade spit, before the story skips back three months to reveal how on earth things came to this. We meet Laing's good-time-girl upstairs neighbour Charlotte (Sienna Miller), her inquisitive, bespectacled son Toby (Louis Suc), the building's architect overlord Anthony (Jeremy Irons), his spoilt missus Ann (Keeley Hawes), the sexually rapacious Oliver Reed-alike Richard (Luke Evans) and his heavily pregnant, chain-smoking wife Helen (Elisabeth Moss). The casting is unimprovable, with every member of the huge ensemble attacking the material with zeal. While Wheatley (Sightseers, Kill List) helms, his wife and frequent collaborator Amy Jump pens the witty screenplay and the pair share editing duties. They've ditched Laing's sister and made tweaks elsewhere but the bare bones of Ballard's book are intact – its thin, allegorical structure is ripe fodder for a cinematic fleshing-out. The delicious detailing makes it unmistakably a Wheatley / Jump film: the building's rooftop garden becomes an absurdly lush private paradise complete with resident horse; young Toby scoffs cornflakes as he watches Laing fight a man over a can of paint in the supermarket – 'You really smashed him up!' he observes cheerfully; and the finale utilises a kaleidoscope in a way that's, ahem, to die for. Like the novel, the film takes on technological dependency and class war, sees the concept of social climbing amusingly literalised, and offers a scathing critique on the human condition – how we're all just a little push from regressing right back to animals (see also the recent Aaaaaaaah!). However, it manages to be uniquely cinematic, with an in-your-face visual style that's both frenzied and precise and that combines idiosyncrasy with influences ranging from British legends Nicolas Roeg and Peter Greenaway, to a multi-mirrored lift that recalls The Lady from Shanghai. High-Rise is a feast of human depravity, flecked with blood, guts and filmmaking genius. It might sound daunting but, take a tip from Laing – embrace the anarchy and you'll survive. Screening on Fri 9 and Sun 11 Oct as part of the London Film Festival 2015. General release Fri 11 Mar. Adaptation of JG Ballard's dystopian novel about a high-rise apartment block which descends into chaos, with Hiddleston as bereaved doctor Robert Laing and Miller as his neighbour. Witty, scathing and uniquely cinematic, flecked with blood, guts and filmmaking genius.